More than 1.5 billion people worldwide suffer from chronic pain, yet current treatment strategies often lack efficacy or have deleterious side effects in patients. Adenosine is an inhibitory neuromodulator that was previously thought to mediate antinociception through the A1 and A2A receptor subtypes. We have since demonstrated that A3AR agonists have potent analgesic actions in preclinical rodent models of neuropathic pain and that A3AR analgesia is independent of adenosine A1 or A2A unwanted effects. 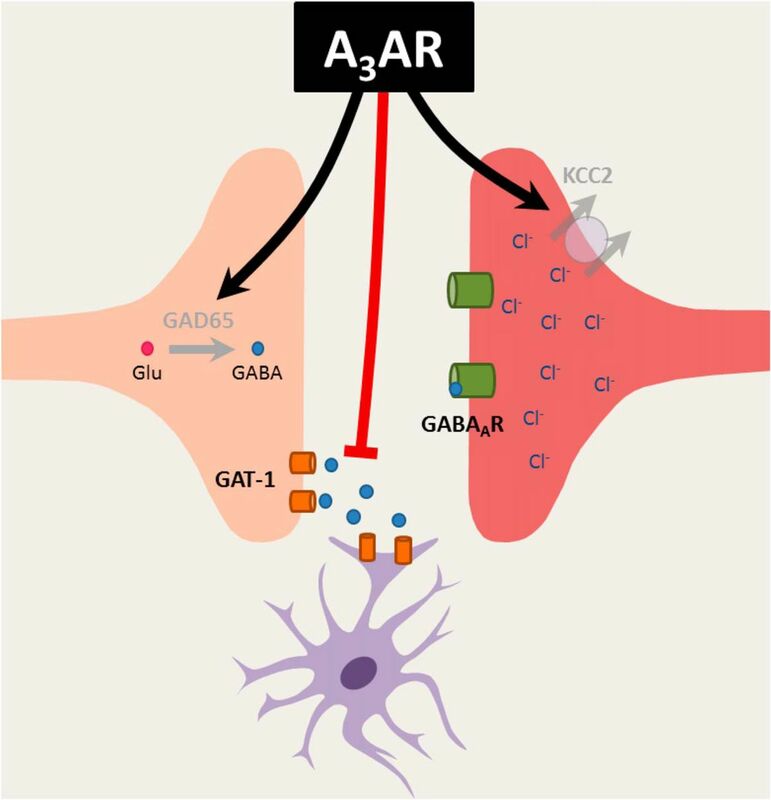 Herein, we explored the contribution of the GABA inhibitory system to A3AR-mediated analgesia using well-characterized mouse and rat models of chronic constriction injury (CCI)-induced neuropathic pain. The deregulation of GABA signaling in pathophysiological pain states is well established: GABA signaling can be hampered by a reduction in extracellular GABA synthesis by GAD65 and enhanced extracellular GABA reuptake via the GABA transporter, GAT-1. In neuropathic pain, GABAAR-mediated signaling can be further disrupted by the loss of the KCC2 chloride anion gradient. Here, we demonstrate that A3AR agonists (IB-MECA and MRS5698) reverse neuropathic pain via a spinal mechanism of action that modulates GABA activity. Spinal administration of the GABAA antagonist, bicuculline, disrupted A3AR-mediated analgesia. Furthermore, A3AR-mediated analgesia was associated with reductions in CCI-related GAD65 and GAT-1 serine dephosphorylation as well as an enhancement of KCC2 serine phosphorylation and activity. Our results suggest that A3AR-mediated reversal of neuropathic pain increases modulation of GABA inhibitory neurotransmission both directly and indirectly through protection of KCC2 function, underscoring the unique utility of A3AR agonists in chronic pain. Chronic pain represents an enormous socioeconomic public health problem that severely limits quality of life for its sufferers. Unfortunately, current treatment strategies are either ineffective (Dworkin et al., 2007) or are accompanied by unacceptable side effects (McNicol et al., 2003). Adenosine, an endogenous purine nucleoside whose actions are mediated through the activation of four G-protein-coupled adenosine receptor (AR) subtypes (A1, A2A, A2B, and A3), has been hypothesized to play an inhibitory role in nociceptive pathways. Indeed, adenosine and selective AR agonists have potent antinociceptive effects in neuropathic pain of various etiologies (Sawynok, 2007). However, the clinical use of A1/A2AR agonists is limited by serious cardiovascular side effects (Zylka, 2011). We recently demonstrated that A3AR agonists have potent analgesic actions in several models of chronic neuropathic pain (Chen et al., 2012; Janes et al., 2014, 2015; Little et al., 2015). Interestingly, selective, orally bioavailable A3AR agonists, such as 1-deoxy-1-[6-[[(3-iodophenyl)methyl]amino]-9H-purin-9-yl]-N-methyl-β-d-ribofuranuronamide (IB-MECA), are in Phase II/III clinical trials for non–pain-related indications and exhibit acceptable safety profiles (Fishman et al., 2012). Although evidence supports the use of A3AR agonists in the management of chronic pain, the underlying mechanism(s) of action are unknown. A3ARs are expressed throughout the nervous system in relevant pain areas (i.e., the rostral ventromedial medulla and the dorsal horn of the spinal cord) and found in neurons and glial cells (Borea et al., 2015; Little et al., 2015). We have characterized the central effects of A3AR, finding that A3AR activation inhibits nociception by engaging bulbospinal analgesic pathways and suppressing the responses of spinal wide dynamic range projection neurons during persistent pain states (Little et al., 2015). Despite the potent inhibitory actions of A3AR on neurotransmission, A3AR analgesia is not mediated by opioid or endocannabinoid pathways (Chen et al., 2012; Little et al., 2015). We therefore questioned whether A3AR agonists might exert their inhibitory actions on nociception by engaging the GABA inhibitory system. In neuropathic pain states, tonic GABA inhibition is suppressed in superficial dorsal horn nociceptive neurons and enhanced excitatory signaling is no longer regulated by inhibitory controls, leading to a net neuronal hyperexcitability (Zeilhofer et al., 2012). Loss of GABA inhibition can result from a number of pathophysiological changes in key components throughout the GABA system. In pathophysiological pain states, reduced levels of spinal GABA (Stiller et al., 1996; Eaton et al., 1998) and its synthesizing enzyme, GAD65 (Eaton et al., 1998; Moore et al., 2002) are observed, whereas the functional expression of the GABA transporter GAT-1, which removes GABA from the synapse (Daemen et al., 2008; Liu et al., 2013), is increased. Additionally, there is a reduction in the activity and expression of the K+-Cl− cotransporter, KCC2 (Coull et al., 2003; Price et al., 2005), which maintains the anion gradient necessary for the inhibitory actions of the GABAA receptor (GABAAR) in neurons. This impairment of GABA signaling produces behavioral hypersensitivity resembling that observed after peripheral nerve injury (Enna and McCarson, 2006). While therapies that enhance GABAergic signaling produce significant analgesia (Malan et al., 2002; McCarson and Enna, 2014), the use of pro-GABAergic therapies as analgesics remains limited by adverse CNS side effects. Taken together, we hypothesize that A3AR agonists reverse neuropathic pain by modulating key components that regulate chloride-mediated inhibition at the spinal level. Male Sprague Dawley rats (200–220 g starting weight) or male CD1 mice (20–30 g) from Harlan Laboratories were housed 2–4 per cage (for rats) and 5 per cage (for mice) in a controlled environment (12 h light/dark cycle) with food and water available ad libitum. All experiments were performed in accordance with the International Association for the Study of Pain and the National Institutes of Health guidelines on laboratory animal welfare and the recommendations by St. Louis University Institutional Animal Care and Use Committee. All experiments were conducted with the experimenters blinded to treatment conditions. Chronic constriction injury (CCI) model. CCI to the sciatic nerve of the left hind leg in mice and rats was performed under general anesthesia using the well-characterized Bennett model (Bennett and Xie, 1988). Briefly, animals were anesthetized with 3% isoflurane/O2 inhalation and maintained on 2% isoflurane/O2 for the duration of surgery. The left thigh was shaved, scrubbed with Nolvasan, and a small incision (1–1.5 cm in length) was made in the middle of the lateral aspect of the left thigh to expose the sciatic nerve. The nerve was loosely ligated around the entire diameter of the nerve at three distinct sites (spaced 1 mm apart) using silk sutures (6.0, mice; 4.0, rats). The surgical site was closed with a single muscle suture and a skin clip. Pilot studies established that under our experimental conditions peak mechano-allodynia develops by D7-D10 following CCI. Test substances or their vehicles were given intraperitoneally (i.p.) at peak mechano-allodynia. IB-MECA was purchased from Tocris Bioscience. MRS1523 (3-propyl-6-ethyl-5-[(ethylthio)carbonyl]-2-phenyl-4-propyl-3-pyridine-carboxylate), bicuculline ([R-(R*,S*)]-6-(5,6,7,8-tetrahydro-6-methyl-1,3-dioxolo[4,5-g]isoquinolin-5-yl)furo[3,4-e]-1,3-benzodioxol-8(6H)-one), and VU0240551 (N-(4-methyl-2-thiazolyl)-2-[(6-phenyl-3-pyridazinyl)thio]-acetamide) were obtained from Sigma-Aldrich. MRS5698 ((1S,2R,3S,4R,5S)-4-(6-((3-chlorobenzyl)amino)-2-((3,4-difluorophenyl) ethynyl)-9H-purin-9-yl)-2,3-dihydroxy-N-methylbicyclo[3.1.0]hexane-1-carboxamide) was synthesized as previously described (Tosh et al., 2012). Mechano-allodynia was measured after animals were allowed to acclimate to elevated cages with a wire mesh floor for 15 min. The plantar aspect of the hindpaw was probed with calibrated von Frey filaments (Stoelting; mice: 0.07–2.00 g; rats: 0.407–26 g) according to the “up-and-down” method (Dixon, 1980) (see Fig. 2). Behavioral testing was done before surgery on D0, on D7 after surgery (peak development of mechano-allodynia), and at different time points (30 min to 5 h) after drug/vehicle administration (given on D7). Animals were then killed by asphyxiation with CO2 and subsequently decapitated as a secondary method, and tissues were collected for further examination. Cultured HEK293 cells were transfected with equal amounts (1 μg) of cDNA encoding the a1, b2, and γ2L subunits of the rat GABAA receptor and eGFP (0.3 μg) using Effectene (QIAGEN). Agonist-induced changes in membrane current were recorded using the amphotericin perforated-patch technique as previously described (Samways et al., 2011). Drugs were applied by using the Perfusion Fast-Step SF-77 System (Warner Instruments). Dorsal horn tissues were obtained from the lower lumbar enlargement (L4-L6) region of the spinal cord and stored immediately at −80°C. Relative protein expression was assessed as previously described (Doyle et al., 2011). Briefly, frozen tissues were homogenized in lysis buffer [20 mm Tris-Cl, pH 7.4, 150 mm NaCl, 0.1% CHAPS, 0.5% Triton X-100, 0.1% SDS, 2 mm EGTA, 5% glycerol, 50 mm sodium fluoride, 1 mm sodium orthovanadate, 1 mm sodium molybdinate, 0.1 m PMSF, 1× phosphatase inhibitor mixture (Sigma-Aldrich), and 1× protease inhibitor mixture (Sigma-Aldrich)], sonicated, and clarified by centrifugation. Total protein concentration was determined by BCA, and samples were heat denatured in 2× Laemmli buffer supplemented with β-mercaptoethanol and then stored at −20°C until assayed. Proteins were resolved by Tris-glycine-SDS electrophoresis with a 4%–20% gel and transferred to nitrocellulose membrane (Bio-Rad). After blocking with 5% nonfat milk or 5% BSA in PBS-T, the membranes were probed overnight at 4°C with primary antibody. Bands were visualized with secondary HRP-conjugated anti-rabbit IgG antibodies (Cell Signaling Technology, 1:2500). Immunoblot images were captured and analyzed using ChemiDoc MP and Image Lab 5.0 (Bio-Rad). All data are expressed as the percentage densitometric signal from the ipsilateral lysate over the animal-matched contralateral lysate normalized to respective β-actin loading control. Total serine phosphorylated protein fractions were immunoprecipitated from ipsilateral and contralateral spinal cord lysates (250 μg). Briefly, agarose-conjugated mouse monoclonal anti-phosphoserine beads (Sigma) were equilibrated in immunoprecipitation buffer (20 mm Tris-Cl, pH 7.4, 150 mm NaCl, 1 mm EDTA, 1 mm EGTA, 10% glycerol) supplemented with 1 mm PMSF, 50 mm NaF, 1 mm Na3VO4, 1 mm Na3MbO4, and 1× phosphatase and protease inhibitor mixtures (Sigma). The equilibrated beads (25 μl) were added to each total protein lysate (250 μg) and brought to 500 μl with immunoprecipitation buffer. After incubation for 18 h at 4°C with continuous inversion, the lysates/bead mixtures were centrifuged 5 min at 1000 × g at 4°C and the supernatant was collected for β-actin (Sigma, 1:2000) analysis of protein loading. The beads were washed 3 times with ice-cold 1× PBS with centrifugation for 5 min at 1000 × g at 4°C then heat-denatured in 2× Laemmli buffer (25 μl) supplemented with β-mercaptoethanol for 5 min at 95°C. The denatured supernatant was subjected to SDS-PAGE (4%–20% TGX, Bio-Rad) and immunoblotting to nitrocellulose. The serine phosphorylation of KCC2, GAT1, and GAD65 was identified by enhanced chemiluminescence using antibodies to KCC2 (Millipore, 1:1000); GAT1 (Abcam, 1:1000), GAD65 (Cell Signaling Technology, 1:1000), and secondary HRP conjugated anti-rabbit IgG antibodies (Cell Signaling Technology, 1:2500). Immunoblot images were captured and analyzed using ChemiDoc MP and Image Lab 5.0 (Bio-Rad). All data are expressed as the percentage densitometric signal from the ipsilateral lysate over the animal-matched contralateral lysate normalized to respective β-actin loading control. where i is the mean gray value, pp is the positive pixel area, and p is total pixel area. Image analysis was performed using the NIH freeware program ImageJ (version 1.43) (Rasband, 1997–2011). Images received background threshold corrections before analysis using the automated ImageJ intermodes histogram-based threshold function. The superficial dorsal horn was outlined on images at the L4, L5, and L6 levels bilaterally using the ImageJ ROI tool. The borders of this region were determined and confirmed using cresyl violet-stained sections of regions adjacent to immunolabeled sections and an atlas (Paxinos and Watson, 1998). Relative MFI was calculated as fold change normalized to the fluorescence intensity of the contralateral (unaffected) dorsal horn (i.e., dividing the fluorescence intensity from superficial dorsal horn of the ipsilateral side by the contralateral side). Data are expressed as arbitrary units. Imaging of Cl− transport in rat spinal cord neurons. Parasagittal spinal slices (400 μm thick) were prepared from rats using a Leica VT1200S Vibratome as previously described (Chéry et al., 2000). Briefly, rats were anesthetized and perfused with ice-cold sucrose ACSF (sACSF), and the spinal cord was retrieved by hydraulic extrusion. After slicing, sections were kept in bubbled ACSF at 34°C. For CCI and sham rats, imaging was only performed on slices ipsilateral to the nerve injury. The paw withdrawal threshold was assessed on each animal before slicing and also 1 h after intraperitoneal injection of MRS5698, to confirm the reversal of allodynia (score >4 g). KCC2-dependent Cl− transport rate was imaged as previously described (Ferrini et al., 2013). Intracellular Cl− slices were incubated in ACSF containing 5 mm the Cl− indicator MQAE (N-(ethoxycarbonylmethyl)-6-methoxyquinolinium bromide, Invitrogen) for 30–40 min and then transferred to a perfusion chamber (2 ml/min) to wash out extracellular MQAE for 10 min. To minimize KCC2-independent Cl− transport, the ACSF used for imaging contained 1 μm TTX, 10 μm CNQX, 40 μm AP5, 1 μm strychnine, and 10 μm gabazine. Fluorescence lifetime imaging of MQAE was acquired as previously described (Doyon et al., 2011; Ferrini et al., 2013). Instrument response function of the detection path was acquired using an 80 nm gold nanoparticle suspension to generate second-harmonic signal. Recorded cells were visually identified by merging transmitted light and MQAE fluorescence. Lifetime images were acquired every 10 s for a period of 7 min. After a control period of 50 s, perfusion solution was switched to ACSF containing 15 mm KCl (osmolarity adjusted using mannitol) to reverse KCC2-mediated Cl− transport (Chorin et al., 2011). Lifetime measurements were compiled over time after the switch in extracellular [K+] to quantify the rate of Cl− import in cells through KCC2. Lifetime values for each cell were averaged over the whole-cell body area and extracted for each time point using custom MATLAB software. Briefly (Digman et al., 2008), we converted the photon timing histograms of each acquired lifetime image to phasor plots. Then, for every time-point, ROIs corresponding to cell bodies were selected and added to a new phasor. Lifetimes of all cells bodies were averaged for each slice at each time point to generate the lifetime time course. All transport rates were tested with the same starting [Cl−]i (i.e., in the period when there is no Cl− load prior to the change in extracellular K+). where PWT1 h = PWT (g) at 1 h after agonist injection on D7, PWTD7 = PWT (g) on D7 before agonist, and PWTD0 = PWT (g) on D0 before surgery. Nonlinear regression analysis was performed using GraphPad Prism version 5.04 (GraphPad Software). Data are expressed as mean ± SEM for n animals. Time-dependent behavior was analyzed by two-tailed, two-way repeated-measures ANOVA with Bonferroni post hoc comparisons to D7 behaviors. Data for Cl− transport were analyzed by one-way ANOVA followed by Bonferroni post hoc comparisons. Protein expression data were determined by Welch's corrected, unpaired, one-tailed, Student's t test. Significant differences were defined as a value of p < 0.05. All statistical analysis was performed using SPSS (Release 21.0, IBM). To examine a potential site of action for the anti-allodynic effects of A3AR agonists, mice were pretreated intrathecally with the selective A3AR antagonist MRS1523 (Li et al., 1998) prior to the systemic administration of IB-MECA. As previously demonstrated (Chen et al., 2012), systemic IB-MECA (1.0 mg/kg; i.p. ; n = 6) given on D7 significantly reverses established mechano-allodynia in the CCI model with peak reversal occurring at 1 h. Local blockade of spinal A3AR with MRS1523 (3 nmol; n = 6), given by intrathecal (i.th.) injection completely blocked IB-MECA's anti-allodynic effects (Fig. 1A; repeated-measures ANOVA, F(2,4) = 75.4, p = 0.001), whereas MRS1523 alone had no effect. IB-MECA's beneficial actions involve a central mechanism of action. Compared with D0, CCI led to a time-dependent development of mechano-allodynia by D7 that was reversed by IB-MECA (1.0 mg/kg; i.p. ), but not its vehicle (A, B). A, Pretreatment with intrathecal MRS1523 (3 nmol) prevented the beneficial effects. 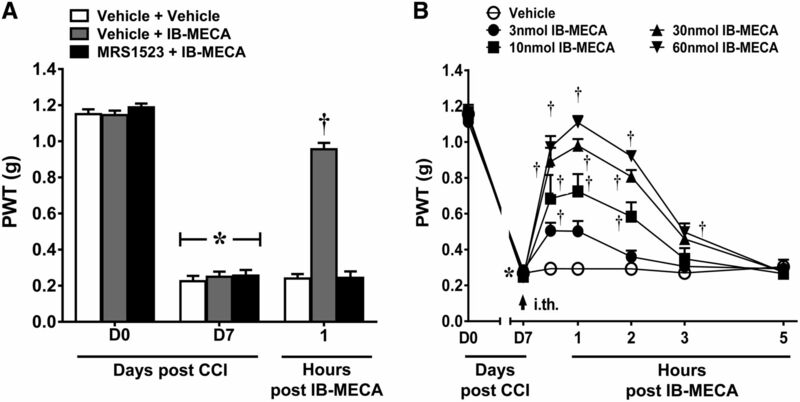 B, Intrathecal administration of IB-MECA (arrow) dose-dependently reversed CCI-induced mechano-allodynia. Data are mean ± SEM; n = 6–8 mice. *p < 0.05 for D7 versus D0 (repeated-measures ANOVA with Bonferroni post hoc comparisons to D7). †p < 0.05 for th post-IB-MECA versus D7 (repeated-measures ANOVA with Bonferroni post hoc comparisons). To confirm that IB-MECA exerts antinociception at the level of the spinal cord, we examined the antinociceptive properties of IB-MECA when administered spinally. As expected, intrathecal administration of IB-MECA (3, 10, 30, or 60 nmol; i.th. ; n = 6), but not its vehicle, dose-dependently reversed CCI-induced mechano-allodynia with a peak reversal at 1 h and an ED50 of 7.73 nmol (95% CI: 5.2–11.5; Fig. 1B; Greenhouse–Geisser corrected repeated-measures ANOVA, ε = 0.474, F(6,24) = 12.1, p = 0.001). To extend our previous work and strengthen evidence of a role for A3AR agonism in pain relief, we used the agent MRS5698, which represents a chemical class unique from IB-MECA. MRS5698 is both orally bioavailable and >1000-fold more selective for A3AR over other AR subtypes; as such, MRS5698 is an excellent pharmacological tool for investigating the mechanism(s) of A3AR analgesia (Tosh et al., 2012). As with IB-MECA, systemic MRS5698 dose-dependently reverses CCI-induced mechano-allodynia (Little et al., 2015). Spinal MRS5698 (3, 10, 30, 60 nmol; i.th. ; n = 6) dose-dependently reversed mechano-allodynia with a calculated ED50 of 6.2 nmol (95% CI: 4.1–9.4; Fig. 2B; Greenhouse–Geisser corrected repeated-measures ANOVA, ε = 0.655, F(6,24) = 15.9, p = 0.001). Moreover, inhibiting spinal A3AR signaling with intrathecal MRS1523 (3.0 nmol; n = 6) blocked the anti-allodynic effects of systemic MRS5698 (1.0 mg/kg; i.p. ; n = 6), confirming an A3AR mechanism of action at the spinal level (Fig. 2A; repeated-measures ANOVA, F(2,4) = 90.2, p = 0.001). We extended our findings to another rodent model of CCI: as in the mouse model, spinal MRS5698 (60 nmol; i.th. ; n = 6) reversed CCI-induced mechano-allodynia in rats (Fig. 2C; Greenhouse–Geisser corrected repeated-measures ANOVA, ε = 0.242, F(6,6) = 5.9, p = 0.019), whereas the vehicle had no effect. MRS5698 reverses CCI-induced mechano-allodynia via spinal mechanisms in both mouse and rat. In mice, CCI led to the time-dependent development of mechano-allodynia by D7 that was reversed by MRS5698 (1.0 mg/kg; i.p. ), but not its vehicle. Pretreatment with intrathecal MRS1523 (3 nmol) prevented the anti-allodynic effects (A) in a dose-dependent manner (B). Intrathecal administration of MRS5698 (arrow) at the highest dose (60 nmol) also reversed mechano-allodynia in a rat model of CCI (C). Data are mean ± SEM; n = 6 mice or rats. *p < 0.05 for D7 versus D0 (repeated-measures ANOVA with Bonferroni comparisons). †p < 0.05 for th post-IB-MECA versus D7 (repeated-measures ANOVA with Bonferroni comparisons). To assess whether the spinal mechanism(s) of action of A3AR agonists might involve GABAergic signaling, we first tested whether the anti-allodynic actions of MRS5698 are dependent on spinal GABAA receptor activation. Spinal pretreatment with the selective GABAA antagonist, bicuculline (0.5 μg; i.th. ; n = 6), 15 min before systemic MRS5698 (1.0 mg/kg; i.p. ; n = 6) abolished the ability of MRS5698 to reverse CCI-induced mechano-allodynia. This effect was observed in both mouse (Fig. 3A; Greenhouse–Geisser corrected repeated-measures ANOVA, ε = 0.297, F(6,12) = 8.8, p = 0.001) and rat models of CCI (Fig. 3B; Greenhouse–Geisser corrected repeated-measures ANOVA, ε = 0.275, F(6,12) = 8.4, p = 0.001) with the dose chosen from previous literature (Nowak et al., 1982). At the dose tested, bicuculline did not affect PWT in naive animals (data not shown). Of note, we have determined that MRS5698 is not a GABAA agonist: interactions of MRS5698 with off-target receptor sites were measured for the most promising leads from in vivo screening. Off-target binding sites (mostly GPCRs) were assayed in a broad high-throughput screen of binding activity using cloned human or rodent cDNAs for CNS receptors and ion channels (in ∼50 assays). This screening was provided by the National Institute of Mental Health Psychoactive Drug Screening Program. MRS5698 was tested at a concentration of 10 μm and did not show significant binding to GABAA receptors (Paoletta et al., 2014). The inability of MRS5698 to act as a GABAA receptor agonist was confirmed electrophysiologically using the perforated-patch technique. GABA (1 μm) evoked robust and reproducible inward currents in voltage-clamped HEK293 cells (Vhold = −60 mV) that transiently expressed either rat a1b2 (n = 5) or a1b2g2L (n = 5) GABAA receptors. In contrast, MRS5698 (10 μm) had no effect (Fig. 3C,D). Bicuculline blocks the anti-allodynic actions of MRS5698. In both mouse (A) and rat (B) models, MRS5698 (gray arrow; 1.0 mg/kg; i.p.) led to a time-dependent development of mechano-allodynia, blocked by pretreatment with bicuculline (black arrow; 0.5 μg; i.th.). Bicuculline alone had no effect (A, B). GABA (1 μm) evoked robust and reproducible inward currents in voltage-clamped (Vhold = −60 mV) HEK293 cells transiently expressing either rat a1b2 (n = 5) or a1b2g2L (n = 5) GABAA receptors. By contrast, MRS5698 (10 μm) had no effect (C). Traces marked with filled circles are shown at an expanded time-scale in D. Data are mean ± SEM; n = 6. *p < 0.05 for D7 versus D0 (repeated-measures ANOVA with Bonferroni comparisons). †p < 0.05 for th post-IB-MECA versus D7 (repeated-measures ANOVA with Bonferroni comparisons). In experimental neuropathic pain, extracellular GABA is depleted through the downregulation of the GABA-synthesizing enzyme GAD65 and the upregulation of the GABA transporter GAT-1; these biological changes are associated with a reduction in the amount of GABA available to bind to GABA receptors and related pain behaviors. The observed inactivation of GAD65 and activation of GAT-1 are caused by dephosphorylation of their regulatory serine residues (Wei et al., 2004; Cristóvão-Ferreira et al., 2009). We therefore asked whether the development of CCI-induced neuropathic pain is associated with GAD65 and GAT-1 modification and whether those modifications are reversed with MRS5698 treatment. Because previous evidence suggests that changes in both spinal GAD65 and GAT-1 occur ipsilateral to nerve injury (Moore et al., 2002), serine phosphorylation of these proteins was analyzed in dorsal horn tissues ipsilateral to nerve injury and harvested from animals at 1 h after MRS5698 or vehicle administration (peak analgesia) with contralateral tissues within the same animal used as a control. We found that CCI (n = 10) decreased the serine phosphorylation of GAD65 (Fig. 4A) and GAT-1 (Fig. 4B) in immunoprecipitate from ipsilateral dorsal horn as compared to the contralateral side. MRS5698 (1.0 mg/kg; i.p. ; n = 10) treatment reversed CCI-induced serine dephosphorylation of GAD65 (Fig. 4A; Welch's corrected one-tailed two-sample t(14.1) = −2.2, p = 0.021) and GAT-1 (Fig. 4B; Welch's corrected one-tailed two-sample t(12.7) = −2.3, p = 0.021) consistent with the reestablishment of GABA bioavailability. We observed no changes in total expression levels in either GAD65 (Welch's corrected one-tailed two-sample t(17.9) = 1.3, p = 0.109) or GAT-1 (Welch's corrected one-tailed two-sample t(15) = 0.90, p = 0.190). MRS5698 restores GABA availability. In rats with CCI-induced pain treated with vehicle, phosphorylation of serine residues on GAD65 (A) and GAT-1 (B) was decreased in dorsal horn tissues ipsilateral to the injury when normalized to contralateral control. Treatment with MRS5698 (1.0 mg/kg; i.p.) reversed this CCI-induced dephosphorylation and restored p-serine levels on the ipsilateral side (A, B). There were no observed changes in total GAD65 (A) or GAT-1 (B) expression. Data are mean ± SEM; n = 10 rats. *p < 0.05 versus Veh (Welch's corrected one-tailed unpaired Student's t test). To assess the ability of A3AR agonists to modulate spinal KCC2, we tested whether spinal KCC2 activity is necessary for MRS5698-mediated reversal of mechano-allodynia. Pretreatment with the selective KCC2 inhibitor, VU0240551 (0.27 μg; i.th. ; n = 6), abolished the anti-allodynic effects of systemic MRS5698 (1.0 mg/kg; i.p. ; n = 6). This effect was observed in both the mouse (Fig. 5A; repeated-measures ANOVA, F(6,12) = 25.9, p = 0.001) and rat (Fig. 5B; Greenhouse–Geisser corrected repeated-measures ANOVA, ε = 0.478, F(6,12) = 37, p = 0.001) models of CCI with the dose chosen from previous studies (Delpire et al., 2009; Austin and Delpire, 2011). At the dose tested, VU0240551 did not affect PWT in naive animals (data not shown). The anti-allodynic actions of MRS5698 involve the restoration of KCC2 activity. In both mouse (A) and rat (B) models, administration of MRS5698 (black arrow; 1.0 mg/kg; i.p.) led to a time-dependent development of mechano-allodynia, which was blocked by pretreatment with VU0240551 (gray arrow; 0.27 μg; i.th.). VU0240551 alone had no effect. In CCI treated with vehicle, phosphorylation of serine residues on KCC2 was decreased in dorsal horn tissues on the side ipsilateral to the injury compared with contralateral control. Treatment with MRS5698 (1.0 mg/kg; i.p.) reversed these effects and increased pSerine levels on the ipsilateral side (C). There were no observed changes in total KCC2 expression in either group (C). Data are mean ± SEM; n = 6. A, B, Repeated-measures ANOVA with Bonferroni comparisons. C, Welch's corrected one-tailed unpaired Student's t test. *p < 0.05 for D7 versus D0. †p < 0.05 drug versus D7. op < 0.05 CCI + MRS5698 versus CCI. Spinal dorsal horn tissues were collected from CCI rats receiving MRS5698 or vehicle treatment at peak analgesia (1 h after administration) and assayed for phosphoserine and total KCC2 protein expression levels. Similar to GAD65 and GAT-1, previous reports indicated that changes in KCC2 activity and expression only occur ipsilateral to the nerve injury. We found that serine phosphorylation of KCC2 in the ipsilateral dorsal horn was decreased in response to CCI (n = 10). MRS5698 administration (1.0 mg/kg; i.p. ; n = 10) restored serine phosphorylation of KCC2 on the ipsilateral side (Fig. 5C; Welch's corrected one-tailed two-sample t(17.7) = −2.053, p = 0.028). Total KCC2 was not changed in either group (Fig. 5C; Welch's corrected one-tailed two-sample t(16.3) = 0.067, p = 0.474). Phosphorylation of the serine 940 residue on KCC2 is the only site explicitly shown to increase KCC2 activity. Thus, we confirmed that phosphorylation at serine 940 was increased in the ipsilateral spinal cord in CCI animals receiving MRS5698. Indeed, systemic MRS5698 (1.0 mg/kg; i.p. ), but not vehicle enhanced pKCC2, in the ipsilateral laminae I and II of the spinal dorsal horn as compared to the contralateral side (Fig. 6A–C; Welch's corrected one-tailed two-sample t(6) = −2.04, p = 0.044). MRS5698 increases phosphorylation of Ser940 on KCC2. Compared with contralateral side on D7, MRS5698 (1.0 mg/kg; i.p. ), but not vehicle, enhanced pKCC2 immunolabeling (red) in the ipsilateral laminae I and II of the dorsal horn (A; white border) (B, C). Higher-magnification images (yellow box) of superficial dorsal horn are merged with DAPI (blue) (C). Negative controls exhibited low levels of background fluorescence (data not shown). MFI is reported as mean fold change comparing ipsilateral/contralateral. Micrographs represent n = 4 rats/group and 3 sections/animal (L4, L5, and L6 spinal cord levels). Data are mean ± SEM in arbitrary units. *p < 0.05 versus CCI D7 (Welch's corrected one-tailed unpaired Student's t test). Scale bars: A, 200 μm; C, 20 μm. To assess whether KCC2 serine phosphorylation is associated with changes in KCC2 activity, we assayed the ability of nerve injury to produce a decrease in KCC2-mediated Cl− transport; furthermore, we asked whether MRS5698 restores normal function of KCC2 in mature neurons. We measured the effect of MRS5698 on Cl− transport in lamina II of spinal cord slices obtained from rats with CCI and control slices from naive or sham animals. KCC2 function was assessed by measuring K+-driven Cl− influx via fluorescence lifetime measurements of the Cl−-sensitive probe MQAE. Changing the [K+]e from 2.5 to 15 mm caused inversion of KCC2 transport and subsequent Cl− accumulation inside cells. The rate of intracellular Cl− change was measured as an index of KCC2-mediated transport rate. CCI animals displayed a slower rate of Cl− transport as compared to sham animals (0.069 and −0.117 ns/min, respectively). When treated with MRS5698 (1 mg/kg; n = 16; i.p. ), the Cl− transport activity was restored to values obtained from naive rats (−0.109 ns/min in naive animals and −0.109 ns/min in CCI animals treated with MRS5698; Fig. 7A–C; one-way ANOVA, F(3) = 4.2, p = 0.013). MRS5698 restores KCC2-mediated Cl− transport. A, Color-coded lifetime image of lamina II cells loaded with the Cl− indicator MQAE, where lower lifetime values correspond to high Cl− concentration. A sharp increase of the extracellular [K+] caused Cl− accumulation in the cells as measured by the lifetime changes of MQAE. One fluorescence lifetime image was taken every 10 s to follow Cl− changes through time. The slope of the Cl− changes is extracted and used as an indication of KCC2 function. In CCI rats (n = 7), there is a decrease in KCC2 function. B, Following injection of MRS5698 (1.0 mg/kg; n = 16; i.p. ), the Cl− transport rate measured is restored to the level of control and sham values. C, Comparison of the slope of Cl− changes measured in lamina II cells in sham, CCI animals, and CCI animals treated with MRS5698. Data are mean ± SEM; n = 6–16 rats. *p < 0.05 for CCI versus sham (one-way ANOVA with Bonferroni's comparisons). †p < 0.05 for CCI + MRS5698 versus CCI (one-way ANOVA with Bonferroni's comparisons). Chronic neuropathic pain represents a major public health problem that will only intensify as an aging population suffers from pain-associated diseases such as arthritis, cancer, and diabetes. Currently, the most effective treatments are either NSAIDs or opiates, which are only moderately effective and exhibit adverse side effects that lead to discontinuation of use (McNicol et al., 2003; Dworkin et al., 2007). Novel mechanism-based treatments for chronic pain are severely lacking and represent a massive unmet clinical need. Adenosine receptor agonists show potent antinociceptive effects in pain models of various etiologies (Zylka, 2011). However, adenosine-related therapies have been restricted to local delivery as they exhibit dangerous cardiovascular side effects when administered systemically. Recently, we have shown that specific A3AR agonists have potent analgesic actions in models of chronic neuropathic pain (Chen et al., 2012; Janes et al., 2014, 2015; Little et al., 2015). Given that A3AR agonists such as IB-MECA are already in Phase II/III clinical trials for psoriasis, hepatitis, rheumatoid arthritis, dry eye, and glaucoma and are exhibiting acceptable safety profiles (Fishman et al., 2012), they show clinical prospective as a novel therapeutic approach to pain. To examine possible mechanisms underlying the antinociceptive actions of A3AR agonists, it is important to first understand their pharmacological characteristics and potential sites of action. Here, we confirm and extend our recent finding that A3AR activation in CNS areas related to pain processing is critical to A3AR agonist-mediated antinociception (Little et al., 2015). We show that IB-MECA exerts its actions at least in part via a spinal mechanism, as blocking spinal A3AR activation with MRS1523 precludes the anti-allodynic effects of systemically administered IB-MECA. We corroborate our findings using the chemically distinct and more selective A3AR agonist MRS5698. Intrathecal administration of MRS5698 dose-dependently reverses mechano-allodynia and spinally administered MRS1523 blocks the antinociception produced by systemically administered MRS5698. Furthermore, we validate our previous findings in a rat CCI model, demonstrating that the proposed A3AR mechanism is not species-specific and permitting future biochemical analyses that require larger amounts of tissue from a small, specific region of the spinal cord. The GABAergic signaling pathway plays an integral role in coordinating both the perception of and response to painful stimuli within the CNS; accordingly, GABA dysfunction is implicated in a number of pain states (Enna and McCarson, 2006). Extensive research efforts have been aimed at the development of drugs that enhance GABAergic signaling and have led to the targeting of not only GABA receptors, but also GABA-associated transporters and enzymes (Jasmin et al., 2004) such as GAT-1 (Schousboe et al., 2004) and GAD65 (Jain, 2008; Vit et al., 2009). Consequently, GABA receptor agonists as well as inhibitors of GABA uptake and metabolism display potent antinociceptive properties in a range of preclinical pain models (Enna and McCarson, 2006). Unfortunately, it has proven difficult to exploit GABA-specific strategies as the activation of GABA receptors in non-nociceptive areas of the CNS yields unfavorable side effects. We offer that A3AR agonists may represent a unique opportunity to tap into the beneficial actions of the GABA signaling pathway while avoiding undesirable side effects in the treatment of chronic pain. In the present work, we demonstrate that the spinal mechanism of MRS5698 antinociception involves GABA signaling as a GABAA antagonist prevents the anti-allodynic action of A3AR agonists. We did not examine the involvement of the GABAB receptor subtype as GABAAR mechanisms are more readily investigated and understood in pathological pain states. 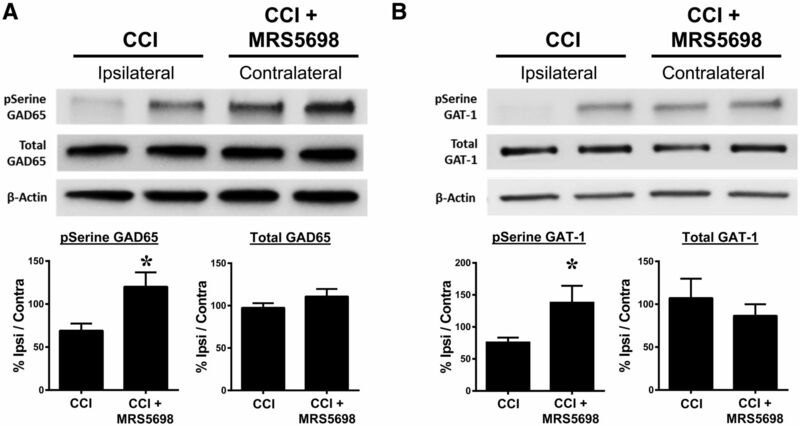 We show that CCI produces a relative loss of phosphorylation of GAD65, an enzyme responsible for GABA synthesis, and GAT-1, a GABA reuptake transporter, whereas MRS5698 treatment maintains the phosphorylation status of GAD65 and GAT-1. Serine phosphorylation is known to activate GAD65 and stabilize it within the plasma membrane (Wei et al., 2004) and serine phosphorylation of GAT-1 signals for internalization and inactivation of the transporter (Law et al., 2000; Whitworth and Quick, 2001) such that the net effect of MRS5698 treatment is likely to increase synaptic GABA availability. Restriction of the effect of MRS5698 to the ipsilateral (injured) side supports our previous finding that A3AR plays a prominent role in modulating pathophysiological pain without altering normal protective pain sensation (Chen et al., 2012; Little et al., 2015). Following peripheral nerve injury, pharmacological enhancements in extracellular GABA can persist beyond the time frame of analgesic efficacy (Cui et al., 1997), suggesting that increases in GABA availability alone fail to compensate for an underlying dysfunction of GABAARs in pathological pain. Extensive evidence suggests that this dysfunction is due to the downregulation and decreased activity of KCC2, a postsynaptically restricted Cl−/K+ cotransporter that functions to maintain the chloride gradient and is crucial to GABAA-mediated postsynaptic inhibition (Williams et al., 1999; Kahle et al., 2008; Miletic and Miletic, 2008; Janssen et al., 2011). In the present work, we highlight the protective effect of MRS5698 administration on KCC2 function: we demonstrate that the anti-allodynic actions of MRS5698 require KCC2 activity as the selective KCC2 inhibitor, VU0240551, completely abrogates the beneficial effects of MRS5698. Additionally, administration of MRS5698 enhances the serine phosphorylation of KCC2 at Ser940, which is to date the only site explicitly shown to increase KCC2 activity (Lee et al., 2007). Indeed, we demonstrate that the rate of KCC2-dependent Cl− extrusion is decreased in CCI versus sham animal spinal cord slices, and MRS5698 administration attenuates this loss of Cl− transport rate. 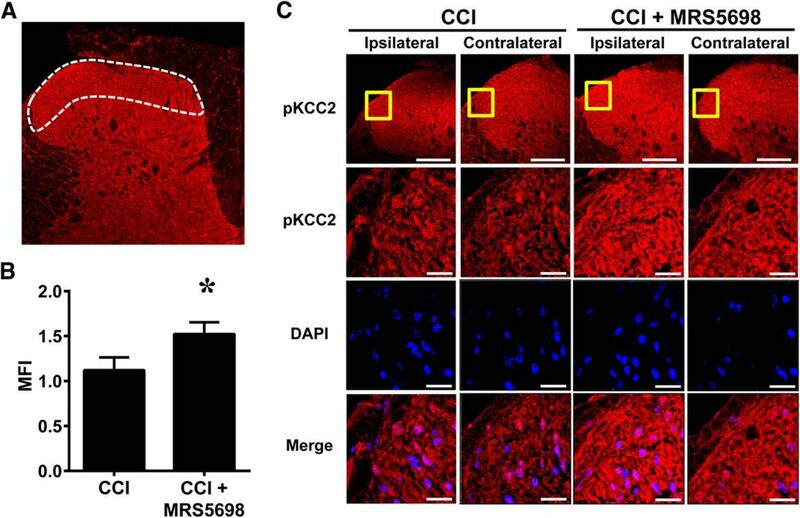 These data indicate that an A3AR-mediated restoration of KCC2-dependent Cl− transport in CNS neurons may underlie the ability of MRS5698 to restore GABAergic neurotransmission in neuropathic pain. To date, it is unknown how A3AR modifies the phosphorylation status of GAD65, GAT-1, and KCC2 to promote GABA function. One possible mechanism is through the A3AR-mediated activation of protein kinase C (PKC): CNS A3ARs can produce PKC activation in neurons by coupling to the Gq intracellular signaling pathway (Abbracchio et al., 1995; Dunwiddie et al., 1997). Previous studies have shown that GAD65 is phosphorylated almost exclusively by PKCε (Wei et al., 2004) and it has been demonstrated that adenosine can activate this PKC isoform in the instance of adenosine-mediated neuroprotection (Di-Capua et al., 2003). Furthermore, PKC is responsible for phosphorylating KCC2 on serine, threonine, and tyrosine residues as a mechanism of regulating intrinsic ion transport rate, cell surface stability, and plasmalemmal trafficking (Kahle et al., 2013). Phosphorylation of KCC2 at Ser940 is specifically PKC-dependent (Lee et al., 2007), suggesting that an A3AR-to-PKC mechanism could feasibly underlie MRS5698-mediated enhancements in GABAergic signaling. Alternatively, PKC-dependent phosphorylation of spinal KCC2 can be mediated by the serotonin (5-HT) axis: activation of 5-HT2A produces PKC activation of KCC2 in spinal neurons and subsequently strengthened neuronal inhibition (Bos et al., 2013). Although the effect of serotonin in pain can be bidirectional, sufficient evidence implicates activation of 5-HT receptor subtypes in descending nociceptive inhibition: projections from the rostral ventromedial medulla elicit the release of serotonin in the spinal dorsal horn and this action can lead to antinociception (Wei et al., 2010; Hossaini et al., 2012; Ossipov et al., 2014). We have demonstrated the role of A3AR in descending inhibitory mechanisms (Little et al., 2015); accordingly, the modulation of descending serotonergic projections by MRS5698 could lead to the observed effects on the GABA-to-KCC2 pathway. In contradistinction, the effects of MRS5698 could be mediated on a broader scale by the neuroinhibitory effects of adenosine on glutamatergic signaling. There is evidence that KCC2 is regulated in an activity-dependent fashion in neurons (Puskarjov et al., 2012) and that this mechanism is relevant in neuropathic pain (Zhou et al., 2012). Indeed, excitatory NMDAR activity can lead to the dephosphorylation of KCC2 at Ser940 (Lee et al., 2011). Because adenosine signaling functions as a vital “fine-tuning” mechanism for neurotransmission in the CNS (Wall and Richardson, 2015) and plays the role of a negative neuromodulator in excitatory synapses (Zhang et al., 2015), A3AR activation may prevent the activity-dependent dephoshorylation of KCC2 and subsequent dysfunction in GABA signaling. Lastly, it is important to consider that MRS5698 could elicit changes in GABAergic signaling by abrogating glial-driven mechanisms of GABA dysfunction in neuropathic pain. To this end, glial-derived BDNF signaling is known to play a pronociceptive role in rodent CCI (Chen et al., 2014) by downregulating KCC2 and disrupting Cl− homeostasis, thereby reducing the strength of GABAA and glycine receptor-mediated postsynaptic inhibition (Biggs et al., 2010; Ferrini and De Koninck, 2013). In this paper, we have not examined whether the A3AR impinges upon the BDNF/TrkB/KCC2 pathway and we are not excluding a potential effect of A3AR agonists on this pathway. It is unlikely that MRS5698 acts directly on TrkB as an off-target because the observations in our manuscript are not consistent with the effects of a TrkB antagonist: in our studies, we have identified Ser940 on KCC2 (Lee et al., 2007) as a critical site of A3AR-mediated regulation. In contrast, TrkB has only been documented to modify Tyr515 on KCC2 in the CNS (Rivera et al., 2004; Choe et al., 2015), and this phosphorylation event produces transporter internalization rather than an increase in transporter activity. Additionally, TrkB activity is not known to regulate the phosphorylation of GAD65 or GAT-1; it has been suggested that TrkB influences these enzymes through a CREB-dependent mechanism of transcriptional regulation (Sanchez-Huertas and Rico, 2011). On the other hand, it is conceivable that MRS5698 may impact BDNF/TrkB/KCC2 signaling by inhibiting the release of BDNF from glial cells as a parallel mechanism to the phosphorylation events we observe in A3AR-mediated restoration of GABAergic function. We have previously demonstrated the capacity of A3AR activation to attenuate astrocyte reactivity and neuroinflammatory response in chemotherapy-induced peripheral neuropathy (Janes et al., 2015) and additionally, A3AR activation may provide neuroprotection by inhibiting the reactive chemotaxis of microglia (Choi et al., 2011). As such, it is possible that an A3AR-mediated reduction in glial activation could preclude glial BDNF release and relieve TrkB-mediated alterations in GABA signaling in contribution to the restoration of GABA signaling that we have observed. Collectively, the findings presented herein provide a pharmacological rationale for the development of A3AR agonists as a novel approach to the treatment of chronic pain. The present work supports our hypothesis that A3AR agonists attenuate neuropathic pain through modulation of the GABAergic signaling pathway. These data provide not only important mechanistic data about the action of A3AR agonists, but also demonstrate the advantage of A3AR as a two-pronged approach to restoring GABAergic function in chronic pain: enhancing GABA bioavailability within the synaptic cleft while also enhancing its efficacy by potentiating KCC2 activity (summarized in Fig. 8). A3AR agonists represent a unique opportunity to tap into the potent beneficial actions of two important inhibitory pain pathways (adenosine and GABA) while avoiding the adverse effects observed with modulatory drugs targeted to these pathways to date. A3AR agonists modulate key components of the GABAergic signaling pathway. The development of neuropathic pain was associated with dysfunction of GAD65 and GAT-1, both of which can result in less GABA availability within the synapse. Additionally, there was a reduction in the expression and activity of KCC2, which can lead to a buildup of intracellular Cl− and the blockade of GABAAR-mediated Cl− influx, resulting in hyperexcitability of the postsynaptic cell. Administration of an A3AR agonist reversed these nerve injury-induced changes, restoring GAD65 and KCC2 activity while inactivating GAT-1. Therefore, A3AR agonists may reverse neuropathic pain by enhancing GABA bioavailability within the synaptic cleft while also enhancing its efficacy by potentiating KCC2 activity. This study was supported by National Cancer Institute Grant RO1CA169519, the St. Louis Cancer Center, the Canadian Institutes of Health Research (MOP 12942), and the National Institute of Diabetes and Digestive and Kidney Diseases Intramural Research Program. We thank Joe Henry Steinbach (Washington University, St. Louis) for the gift of plasmids encoding the GABA subunits. (1995) G protein-dependant activation of phospholipase C by adenosine A3 receptors in the rat brain. Mol Pharmacol 48:1038–1045, pmid:8848003. (2011) Inhibition of KCC2 in mouse spinal cord neurons leads to hypersensitivity to thermal stimulation. Anesth Analg 113:1509–1515, doi:10.1213/ANE.0b013e31822e0a5d, pmid:21965363. (1988) A peripheral mononeuropathy in rat that produces disorders of pain sensation like those seen in man. Pain 33:87–107, doi:10.1016/0304-3959(88)90209-6, pmid:2837713. (2010) Is BDNF sufficient for information transfer between microglia and dorsal horn neurons during the onset of central sensitization? Mol Pain 6:44, doi:10.1186/1744-8069-6-44, pmid:20653959. (2015) The A3 adenosine receptor: history and perspectives. Pharmacol Rev 67:74–102, doi:10.1124/pr.113.008540, pmid:25387804. (2013) Activation of 5-HT2A receptors upregulates the function of the neuronal K-Cl cotransporter KCC2. Proc Natl Acad Sci U S A 110:348–353, doi:10.1073/pnas.1213680110, pmid:23248270. (2014) Presynaptic GABAergic inhibition regulated by BDNF contributes to neuropathic pain induction. Nat Commun 5:5331, doi:10.1038/ncomms6331, pmid:25354791. (2012) Controlling murine and rat chronic pain through A3 adenosine receptor activation. FASEB J 26:1855–1865, doi:10.1096/fj.11-201541, pmid:22345405. (2000) Visualization of lamina I of the dorsal horn in live adult rat spinal cord slices. J Neurosci Methods 96:133–142, doi:10.1016/S0165-0270(99)00195-8, pmid:10720677. (2015) High salt intake increases blood pressure via BDNF-mediated downregulation of KCC2 and impaired baroflex inhibition of vasopressin neurons. Neuron 85:549–560, doi:10.1016/j.neuron.2014.12.048, pmid:25619659. (2011) A3 adenosine receptor agonist reduces brain ischemic injury and inhibits inflammatory cell migration in rats. J Pathol 179:2042–2052, doi:10.1016/j.ajpath.2011.07.006, pmid:21854743. (2011) Upregulation of KCC2 activity by zinc-mediated neurotransmission via the mZnR/GPR39 receptor. J Neurosci 31:12916–12926, doi:10.1523/JNEUROSCI.2205-11.2011, pmid:21900570. (2003) Trans-synaptic shift in anion gradient in spinal lamina I neurons as a mechanism of neuropathic pain. Nature 424:938–942, doi:10.1038/nature01868, pmid:12931188. (2009) Adenosine A2A receptors enhance GABA transport into nerve terminals by restraining PKC inhibition of GAT-1. J Neurochem 109:336–347, doi:10.1111/j.1471-4159.2009.05963.x, pmid:19200339. (1997) Spinal cord stimulation attenuates augmented dorsal horn release of excitatory amino acids in mononeuropathy via a GABAergic mechanism. Pain 73:87–95, doi:10.1016/S0304-3959(97)00077-8, pmid:9414060. (2008) Upregulation of the GABA-transporter GAT-1 in the spinal cord contributes to pain behaviour in experimental neuropathy. Neurosci Lett 444:112–115, doi:10.1016/j.neulet.2008.08.001, pmid:18694804. (2009) Small-molecule screen identifies inhibitors of the neuronal K-Cl cotransporter KCC2. Proc Natl Acad Sci U S A 106:5383–5388, doi:10.1073/pnas.0812756106, pmid:19279215. (2003) Protein kinase C-epsilon is involved in the adenosine-activated signal transduction pathway conferring protection against ischemia-reperfusion injury in primary rat neuronal cultures. J Neurochem 84:409–412, doi:10.1046/j.1471-4159.2003.01563.x, pmid:12559003. (2008) The phasor approach to fluorescence lifetime imaging analysis. Biophys J 94:L14–L16, doi:10.1529/biophysj.107.120154, pmid:17981902. (1980) Efficient analysis of experimental observations. Annu Rev Pharmacol Toxicol 20:441–462, doi:10.1146/annurev.pa.20.040180.002301, pmid:7387124. (2011) Intraplantar-injected ceramide in rats induces hyperalgesia through an NF-kappaB- and p38 kinase-dependent cyclooxygenase 2/prostaglandin E2 pathway. FASEB J 25:2782–2791, doi:10.1096/fj.10-178095, pmid:21551240. (2011) Efficacy of synaptic inhibition depends on multiple, dynamically interacting mechanisms implicated in chloride homeostasis. PLoS Comput Biol 7:e1002149, doi:10.1371/journal.pcbi.1002149, pmid:21931544. (1997) Activation of hippocampal adenosine A3 receptors produces a desensitization of A1 receptor-mediated responses in rat hippocampus. J Neurosci 17:607–614, pmid:8987783. (2007) Pharmacologic management of neuropathic pain: evidence-based recommendations. Pain 132:237–251, doi:10.1016/j.pain.2007.08.033, pmid:17920770. (1998) Changes in GAD- and GABA-immunoreactivity in the spinal dorsal horn after peripheral nerve injury and promotion of recovery by lumbar transplant of immortalized serotonergic precursors. J Chem Neuroanat 16:57–72, doi:10.1016/S0891-0618(98)00062-3, pmid:9924973. (2006) The role of GABA in the mediation and perception of pain. Adv Pharmacol 54:1–27, doi:10.1016/S1054-3589(06)54001-3, pmid:17175808. (2013) Microglia control neuronal network excitability via BDNF signalling. Neural Plasticity 2013:429815, doi:10.1155/2013/429815, pmid:24089642. (2013) Morphine hyperalgesia gated through microglia-mediated disruption of neuronal Cl(−) homeostasis. Nat Neurosci 16:183–192, doi:10.1038/nn.3295, pmid:23292683. (2012) Pharmacological and therapeutic effects of A3 adenosine receptor agonists. Drug Discov Today 17:359–366, doi:10.1016/j.drudis.2011.10.007, pmid:22033198. (2012) Distribution of glycine/GABA neurons in the ventromedial medulla with descending spinal projections and evidence for an ascending glycine/GABA projection. PLoS One 7:e35293, doi:10.1371/journal.pone.0035293, pmid:22558137. (2008) Gene therapy for pain. Expert Opin Biol Ther 8:1855–1866, doi:10.1517/14712590802496977, pmid:18990073. (2014) A3 adenosine receptor agonist prevents the development of paclitaxel-induced neuropathic pain by modulating spinal glial-restricted redox-dependent signaling pathways. Pain 155:2560–2567, doi:10.1016/j.pain.2014.09.016, pmid:25242567. (2015) Spinal neuroimmune activation is independent of T-cell infiltration and attenuated by A3 adenosine receptor agonists in a model of oxaliplatin-induced peripheral neuropathy. Brain Behav Immun 44:91–99, doi:10.1016/j.bbi.2014.08.010, pmid:25220279. (2011) Differential GABAergic disinhibition during the development of painful peripheral neuropathy. Neuroscience 184:183–194, doi:10.1016/j.neuroscience.2011.03.060, pmid:21496475. (2004) GABA puts a stop to pain. Curr Drug Targets CNS Neurol Disord 3:487–505, doi:10.2174/1568007043336716, pmid:15578966. (2008) Roles of the cation-chloride cotransporters in neurological disease. Nat Clin Pract Neurol 4:490–503, doi:10.1038/ncpneuro0883, pmid:18769373. (2013) Modulation of neuronal activity by phosphorylation of the K-Cl cotransporter KCC2. Trends Neurosci 36:726–737, doi:10.1016/j.tins.2013.08.006, pmid:24139641. (2000) Functional regulation of gamma-aminobutyric acid transporters by direct tyrosine phosphorylation. J Biol Chem 275:23986–23991, doi:10.1074/jbc.M910283199, pmid:10816599. (2007) Direct protein kinase C-dependent phosphorylation regulates the cell surface stability and activity of the potassium chloride cotransporter KCC2. J Biol Chem 282:29777–29784, doi:10.1074/jbc.M705053200, pmid:17693402. (2011) NMDA receptor activity downregulates KCC2 resulting in depolarizing GABAA receptor-mediated currents. Nat Neurosci 14:736–743, doi:10.1038/nn.2806, pmid:21532577. (1998) Structure-activity relationships and molecular modeling of 3, 5-diacyl-2,4-dialkylpyridine derivatives as selective A3 adenosine receptor antagonists. J Med Chem 41:3186–3201, doi:10.1021/jm980093j, pmid:9703464. (2012) Supraspinal peroxynitrite modulates pain signaling by suppressing the endogenous opioid pathway. J Neurosci 32:10797–10808, doi:10.1523/JNEUROSCI.6345-11.2012, pmid:22875915. (2015) Endogenous adenosine A3 receptor activation selectively alleviates persistent pain states. Brain 138:28–35, doi:10.1093/brain/awu330, pmid:25414036. (2013) Suppressing SNAP-25 and reversing glial glutamate transporters relieves neuropathic pain in rats by ameliorating imbalanced neurotransmission. Chin Med J (Engl) 126:4100–4104, pmid:24229681. (2002) Spinal GABA(A) and GABA(B) receptor pharmacology in a rat model of neuropathic pain. Anesthesiology 96:1161–1167, doi:10.1097/00000542-200205000-00020, pmid:11981157. (2014) GABA pharmacology: the search for analgesics. Neurochem Res 39:1948–1963, doi:10.1007/s11064-014-1254-x, pmid:24532294. (2003) Management of opioid side effects in cancer-related and chronic noncancer pain: a systematic review. J Pain 4:231–256, doi:10.1016/S1526-5900(03)00556-X, pmid:14622694. (2008) Loose ligation of the sciatic nerve is associated with TrkB receptor-dependent decreases in KCC2 protein levels in the ipsilateral spinal dorsal horn. Pain 137:532–539, doi:10.1016/j.pain.2007.10.016, pmid:18063479. (2002) Partial peripheral nerve injury promotes a selective loss of GABAergic inhibition in the superficial dorsal horn of the spinal cord. J Neurosci 22:6724–6731, pmid:12151551. (1982) GABA and bicuculline actions on mouse spinal cord and cortical neurons in cell culture. Brain Res 244:155–164, doi:10.1016/0006-8993(82)90913-1, pmid:6288177. (2014) Descending pain modulation and chronification of pain. Curr Opin Support Palliat Care 8:143–151, doi:10.1097/SPC.0000000000000055, pmid:24752199. (2014) Structural probing of off-target G protein-coupled receptor activities within a series of adenosine/adenine congeners. PLoS One 9:e97858, doi:10.1371/journal.pone.0097858, pmid:24859150. (2005) Role of cation-chloride-cotransporters (CCC) in pain and hyperalgesia. Curr Top Med Chem 5:547–555, doi:10.2174/1568026054367629, pmid:16022677. (2012) Activity-dependent cleavage of the K-Cl cotransporter KCC2 mediated by calcium-activated protease calpain. J Neurosci 32:11356–11364, doi:10.1523/JNEUROSCI.6265-11.2012, pmid:22895718. (1997–2011) ImageJ (National Institutes of Health, Bethesda, MD). (2004) Two developmental switches in GABAergic signaling: the K+-Cl− contransporter KCC3 and carbonic anhydrase CAVII. J Physiol 562:27–36, doi:10.1113/jphysiol.2004.077495, pmid:15528236. (1993) Molecular cloning and characterization of the human A3 adenosine receptor. Proc Natl Acad Sci U S A 90:10365–10369, doi:10.1073/pnas.90.21.10365, pmid:8234299. (2011) Preferential use of unobstructed lateral portals as the access route to the pore of human ATP-gated ion channels (P2X receptors). Proc Natl Acad Sci U S A 108:13800–13805, doi:10.1073/pnas.1017550108, pmid:21808018. (2011) CREB-dependent regulation of GAD65 transcription by BDNF/TrkB in cortical interneurons. Cereb Cortex 21:777–788, doi:10.1093/cercor/bhq150, pmid:20739478. (2007) Adenosine and ATP receptors. Handb Exp Pharmacol 177:309–328, pmid:17087128. (2004) GABA transporters as drug targets for modulation of GABAergic activity. Biochem Pharmacol 68:1557–1563, doi:10.1016/j.bcp.2004.06.041, pmid:15451399. (1996) Release of gamma-aminobutyric acid in the dorsal horn and suppression of tactile allodynia by spinal cord stimulation in mononeuropathic rats. Neurosurgery 39:367–374, doi:10.1097/00006123-199608000-00026, pmid:8832675, discussion 374–375. (2012) Structure-guided design of A(3) adenosine receptor-selective nucleosides: combination of 2-arylethynyl and bicyclo[3.1.0]hexane substitutions. J Med Chem 55:4847–4860, doi:10.1021/jm300396n, pmid:22559880. (2009) Adenovector GAD65 gene delivery into the rat trigeminal ganglion produces orofacial analgesia. Mol Pain 5:42, doi:10.1186/1744-8069-5-42, pmid:19656360. (2015) Localised adenosine signalling provides fine-tuned negative feedback over a wide dynamic range of neocortical network activities. J Neurophysiol 113:871–882, doi:10.1152/jn.00620.2014, pmid:25392170. (2010) Molecular depletion of descending serotonin unmasks its novel facilitatory role in the development of persistent pain. J Neurosci 30:8624–8636, doi:10.1523/JNEUROSCI.5389-09.2010, pmid:20573908. (2004) Protein phosphorylation of human brain glutamic acid decarboxylase (GAD)65 and GAD67 and its physiological implications. Biochemistry 43:6182–6189, doi:10.1021/bi0496992, pmid:15147202. (2001) Substrate-induced regulation of gamma-aminobutyric acid transporter trafficking requires tyrosine phosphorylation. J Biol Chem 276:42932–42937, doi:10.1074/jbc.M107638200, pmid:11555659. (1999) The neuron-specific K-Cl cotransporter, KCC2: antibody development and initial characterization of the protein. J Biol Chem 274:12656–12664, doi:10.1074/jbc.274.18.12656, pmid:10212246. (2012) Fast synaptic inhibition in spinal sensory processing and pain control. Physiol Rev 92:193–235, doi:10.1152/physrev.00043.2010, pmid:22298656. (2015) Adenosine effects on inhibitory synaptic transmission and excitation-inhibition balance in the rat neocortex. J Physiol 593:825–841, doi:10.1113/jphysiol.2014.279901, pmid:25565160. (2012) N-Methyl-d-aspartate receptor- and calpain-mediated proteolytic cleavage of K+-Cl− cotransporter-2 impairs spinal chloride homeostasis in neuropathic pain. J Biol Chem 287:33853–33864, doi:10.1074/jbc.M112.395830, pmid:22854961. (2011) Pain-relieving prospects for adenosine receptors and ectonucleotidases. Trends Mol Med 17:188–196, doi:10.1016/j.molmed.2010.12.006, pmid:21236731.